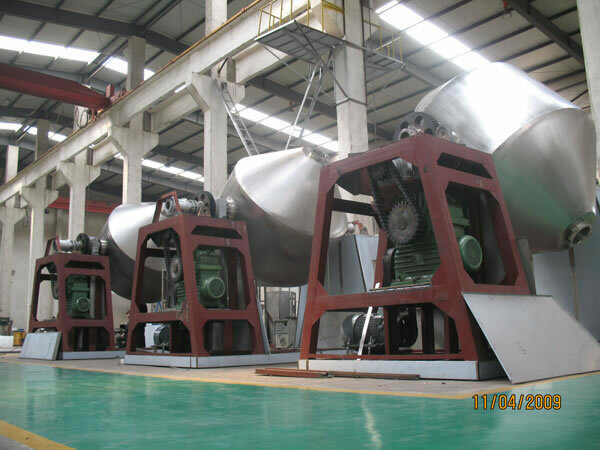 The SZG Double Conical Revolving Vacuum Drying Equipment has a double conical rotating cylinder. Under the state of vacuum in the cylinder, oil or hot water is passed into the jacket to heat. The heat comes into contact with damp raw materials through the inner wall. The evaporated steam is exhausted through the vacuum pump. Because the inside of the cylinder of the revolving vacuum drying equipment is a vacuum and the cylinder makes the raw material turn over from top to bottom and from inside to outside, the drying speed is speeded and the drying efficiency is raised, thus uniform drying can be achieved. 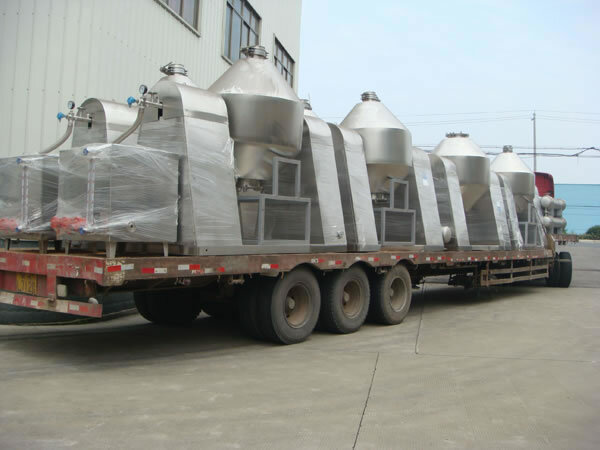 The Double Conical Revolving Vacuum drying equipment is a new style dryer integrating mixing and drying in one body. It is equipped with a condenser and vacuum pump. (If the solvent does not recover, the condenser may not be used). The design of this machine is advanced and its inner structure is simple. Therefore it is clean, very convenient, and the raw material can be discharged fully. It can reduce labor and improve the working environment. When the cylinder is rotating, the raw material is rotated too, so it does not collect anywhere. Its coefficient of thermal transmission is high and the drying speed is high. Not only does it save energy, but also the raw material can be dried fully and uniformly and the quality of the product is high. The revolving vacuum drying equipment is used widely in the pharmaceutical industry, chemical industry, foodstuff industry, dyestuff industry, and more. Note: For raw material, if its volume is greatly changed after drying, then its filling coefficient may be increased or decreased accordingly. A speed-adjusting motor of 0-6rpm might be chosen to use with the revolving vacuum drying equipment, according to the user's requirements. The following aspects should be pointed out when ordering. 1. The above mentioned parameters are calculated based on material density of 0.6g/cm3. If it is greater than this, please advise us when ordering. 3. If a glass lining for interior surface is required, please request this. If the raw material is explosive, or flammable, the calculation should be made according to trial results. 1. Heat sensitive raw materials that cannot be dried at high temperatures. 2. Raw material that easily oxidizes or is dangerous. 3. Raw material that the solvent and toxic gases are needed to be recovered. 4. Raw material with special requirements for crystal shape. 5. Raw material that have special requirements for the content of volatile residuals. 1. 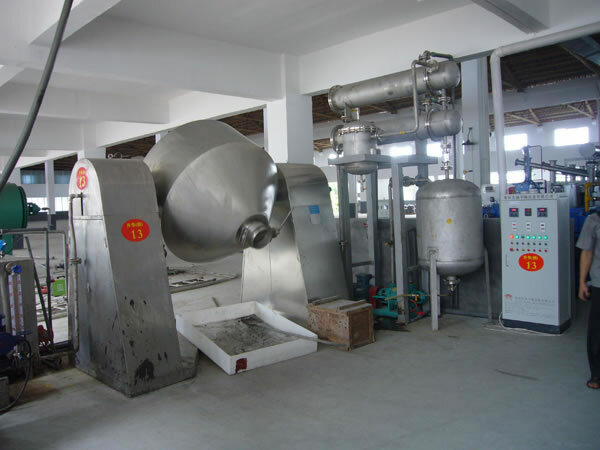 The revolving vacuum drying equipment has two methods: hot water and heat conduction oil. 2. When ordering, please indicate the temperature of the raw material to be used or the operation temperature of the dryer, in order to choose a suitable heat source for you. 3. When working with dry, viscous raw material, our factory will design a special stirring device in the chamber to accommodate this. 4. 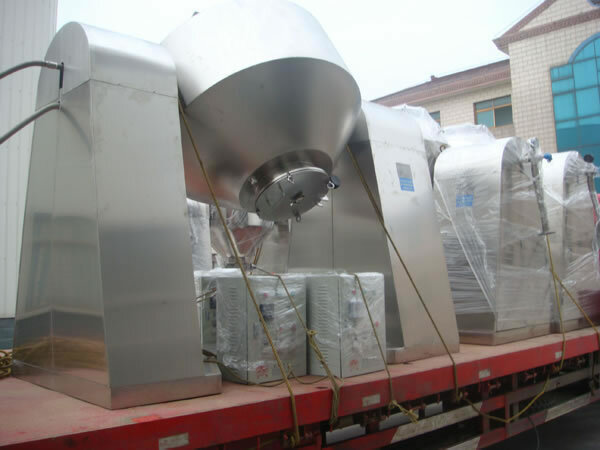 The auxiliary parts of the vacuum drying equipment can be supplied and installed by our factory. Please indicate them when ordering. 5. If you have any special requirements, our factory can also design, manufacture and install according to request.